The popularity of the musical Hamilton continues to grow daily. The show is the hottest ticket in town, and those who have been able to obtain tickets and pony up the $100-$1,000 per ticket to see it cannot stop raving about it to those who haven’t (or won’t). Now a bunch of your favorite artists have come together and collaborated on a mixtape inspired by the Broadway show. The Hamilton Mixtape is 23 tracks of musical goodness featuring everyone from Queen Latifah, Ashanti and Ja Rule to the Roots, Chance the Rapper and Nas. 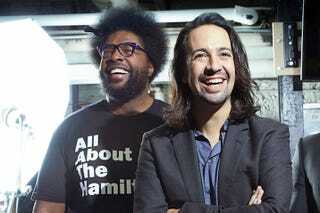 Today The Hamilton Mixtape has officially landed to help you wait out the ticket lottery. It should be noted that if you’re intending to give this thing a run on your lunch hour you maybe getting into a bit more of an emotional journey than you’ll be able to explain to your coworkers upon return. It’s deep, rich and timely notes just when you need it most. The Hamilton Mixtape is available for streaming on Spotify and purchase on iTunes. Check it out for yourself.